(Nanowerk News) Topological insulators are materials that let electric current flow across their surface while keeping it from passing it through their bulk. This exotic property makes topological insulators very promising for electricity with less energy loss, spintronics, and perhaps even quantum computing. EPFL scientists have now identified a new class of topological insulators, and have discovered its first representative material, which could propel topological insulators into applications. The work, which was carried out within the framework of the EPFL-led NCCR Marvel project, is published in Nature Materials ("A Novel Quasi-One-Dimensional Topological Insulator in Bismuth Iodide β-Bi4I4"). The technological promise of topological insulators has led to an intense search for optimal natural and man-made materials with such properties. Such research combines theoretical work that predicts what properties the structure of a particular material would have. The "candidate" materials that are identified with computer simulations are then passed for experimental examination to see if their topological insulating properties match the theoretical predictions. This is what the lab of Oleg Yazyev at EPFL's Institute of Theoretical Physics has accomplished, working with experimentalist colleagues from around the world. 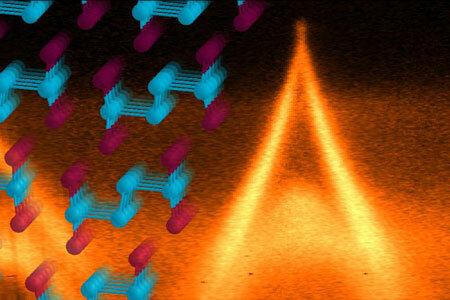 By theoretically testing potential candidates from the database of previously described materials, the team has identified a material, described as a "crystalline phase" of bismuth iodide, as the first of a new class of topological insulators. What makes this material particularly exciting is the fact that its atomic structure does not resemble any other topological insulator known to date, which makes its properties very different as well. One clear advantage of bismuth iodide is that its structure is more ordered than that of previously known topological insulators, and with fewer natural defects. In order to have an insulating interior, a material must have as few defects in its structure as possible. "What we want is to pass current across the surface but not the interior," explains Oleg Yazyev. "In theory, this sounds like an easy task, but in practice you'll always have defects. So you need to find a new material with as few of them as possible." The study shows that even these early samples of bismuth iodide appear to be very clean with very small concentration of structural imperfections. After characterizing bismuth iodide with theoretical tools, the scientists tested it experimentally with an array of methods. The main evidence came from a direct experimental technique called "angle-resolved photoemission spectroscopy". This method allows researchers to "see" electronic states on the surface of a solid material, and has become a key technique for proving the topological nature of electronic states at the surface. The measurements, carried out at the Lawrence Berkeley National Lab, proved to be fully consistent with the theoretical predictions made by Gabriel Autès, a postdoc at Yazyev's lab and lead author of the study. The actual electron structure calculations were performed at the Swiss National Supercomputing Centre, while data analysis included a number of scientists from EPFL and other institutions. "This study began as theory and went through the entire chain of experimental verification," says Yazyev. "For us is a very important collaborative effort." His lab is now exploring further the properties of bismuth iodide, as well materials with similar structures. Meanwhile, other labs are joining the effort to support the theory behind the new class of topological insulators and propagate the experimental efforts.